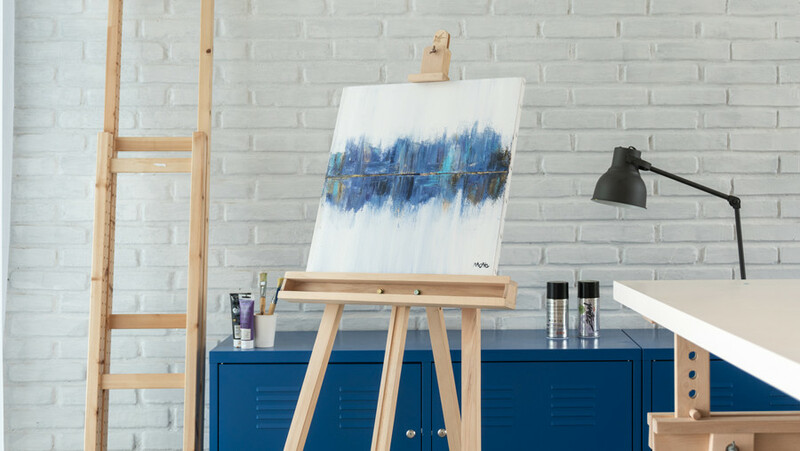 An acute sense of observation is an essential talent for a contemporary artist. The ability to scrutinise and reflect on one’s own conduct and thoughts, along with that of the collective, is a doorway to art rich in meaning. For more than a decade Balinese artist Made Aji Aswino has been an avid onlooker and critic of the human character and behaviour, especially what he has witnessed within his own society. 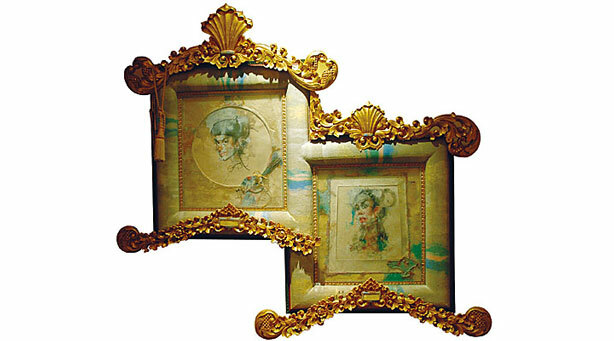 His sketches, paintings, sculptures and installations focus upon the pitfalls of the human ego. 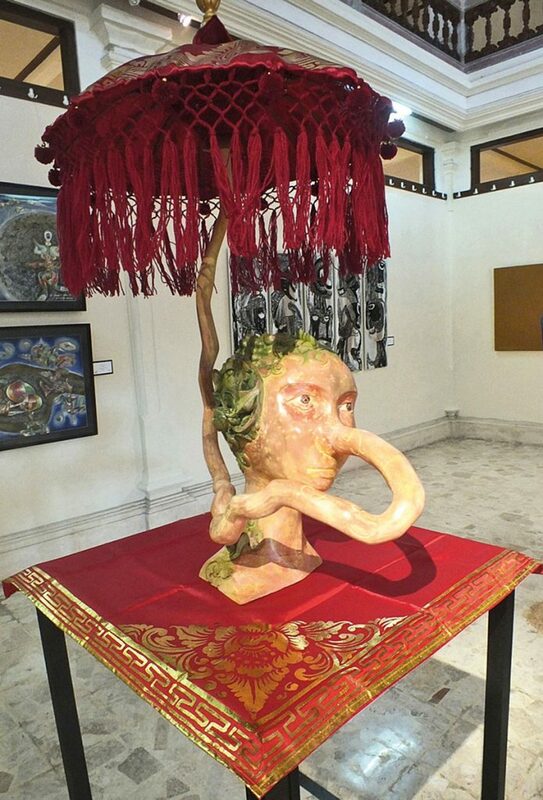 During the landmark 2013 exhibition “Irony In Paradise” by the Balinese art collective Sanggar Dewata Indonesia (SDI) at Ubud’s Agung Rai Museum of Art, Aswino Aji exhibited an eye-catching and imaginative sculpture that was highly critical of his Balinese culture. He adapted the topic that had been the focus of his paintings and sketches, this, however, was his first thematic venture within the 3 dimensional form. 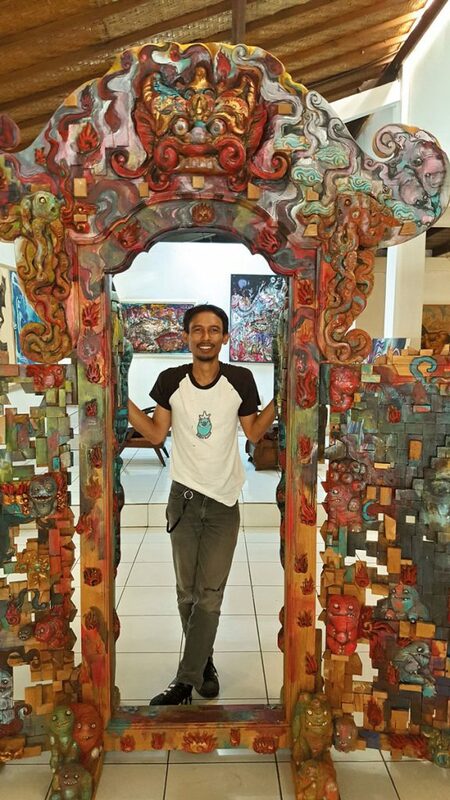 In the most important international exhibition of Balinese contemporary art in 2016 that showcased the finest emerging talent of Bali, “Crossing: Beyond Baliseering”, held in December at Forty Five Downstairs Gallery in Melbourne, Australia, Aswino Aji exhibited the monumental wood carving installation, “Doors of Perception”. Spanning four meters wide, by two and half meters high, his representation of a traditional doorway into a Balinese house created over a six-month period. 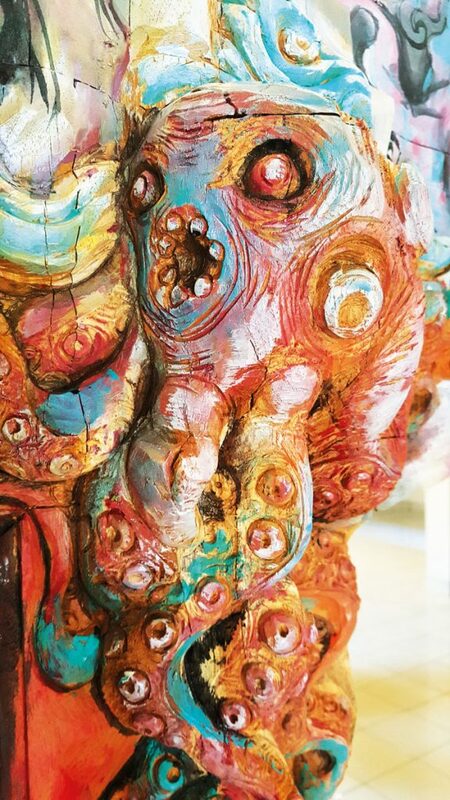 It featured eerie figurines and faces of monsters that are his representations of the darker elements of the ego. 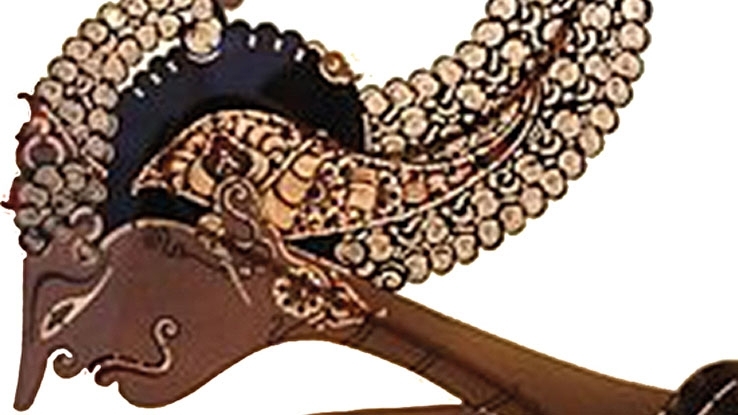 Included also were some of the typical iconography to be found in traditional Balinese carvings. 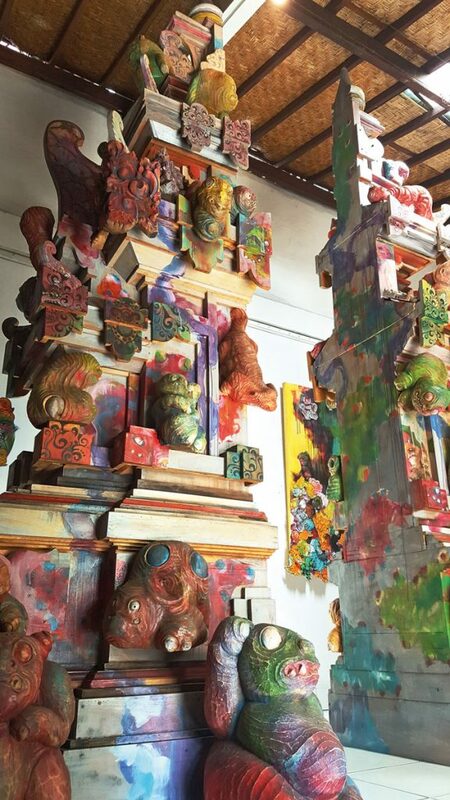 The vibrantly painted creatures adorned the work along with his Pinocchio character – a reflection on the pretensions and lies of everyday Balinese society the artist witnesses. The dynamic colours of the outside of the entrance represented varieties of ‘disorderly’ human personalities, while the inner side of “Doors of Perception” reflected life’s dualities, painted in subdued monochromes and representing the ‘peaceful’ personalities. “Ego Invasion”, 2018, Aswino Aji’s most recent installation is themed upon the candi (Balinese temple gates) and is a commissioned art work for Soundrenaline – Soul of Expression GWK Bali, 8-9 September 2018, a music and youth cultural event held at the GWK Cultural Park in Jimbaran. Created within a whirlwind one-month period at his studio, Aswino Aji employed wood carvers from his family in Silakarang village, Gianyar, to help carve the icons and build the structure. With dimensions measuring over three meters high by three meters wide, one of the strengths of this work was in its design, engineered to be simply and quickly dismantled and reinstalled. Born in 1977 in Silakarang, Aswino Aji is the son of the wood carver, renowned contemporary artist and gallerist Wayan Sika. 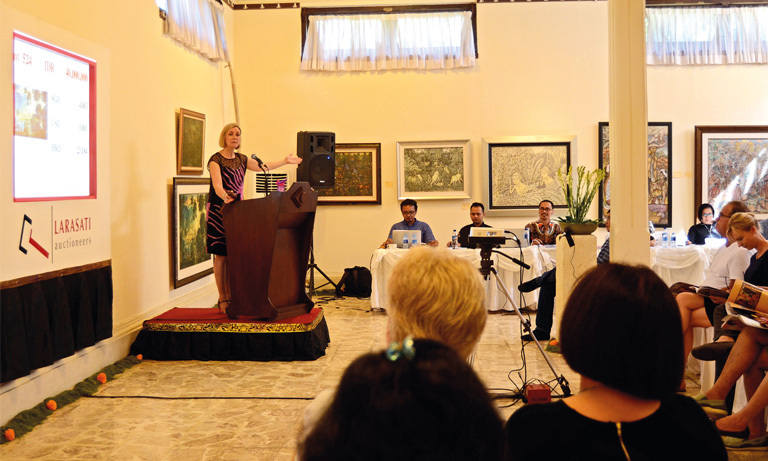 Following in his father’s footsteps he studied fine art at ISI Yogyakarta, the Indonesian Institute of Art in Central Java, were he resided for five years. Aswino Aji has taken authentic motifs, patterns and forms from traditional architecture and sculpture and has presented them within the contemporary art realm, while making relevant social statements. In doing so he has made new inroads in Balinese woodcarving and an important contribution to the development of Balinese contemporary.